I’m never a fan of baked rice as those I’ve tasted outside are always a tad too creamy and milky for me – and I can never finish one whole plate by myself. X, on the other hand, loves baked rice so much that I decided to try baking one for him. Luckily I found one by Kate on chow.com – and it was perfect! 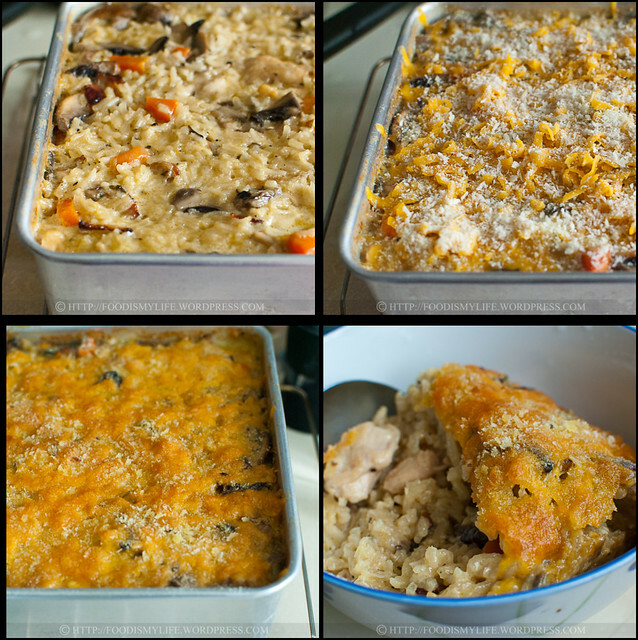 Her original recipe was plain cheesy baked rice but I added in bacon, chicken, mushrooms and carrots for a lip-smacking and cheesy comfort meal with just the right amount of creaminess. A creamy and delicious concoction to die for! On a random side note, I can’t believe it’s already November! Only a few more weeks left and we’re going to celebrate one of everyone’s favourite holidays of the year – Christmas! I wish I have more time to experiment new recipes, but work is piling up at such a fast rate that it’s getting hard for me to even find time to participate in baking events and churn out blog posts. I think most likely I’ll be sticking to my no-fail recipes (I think I’ll do a round-up some time soon)! I used chicken fillet as they’re my preferred choice of cut as compared to chicken breasts. I marinate the chicken in some soy sauce (for some saltiness) and corn flour. Corn flour absorbs the liquid (soy sauce) and helps to keep the meat tender and gives the meat a nice golden colour during searing. You can marinate the chicken with just salt and black pepper, and then just sear it as well. The chicken doesn’t have to be completely cooked as it’ll finish cooking in the oven – I just like the nice golden brown colour in the chicken. Get ready all your other ingredients! 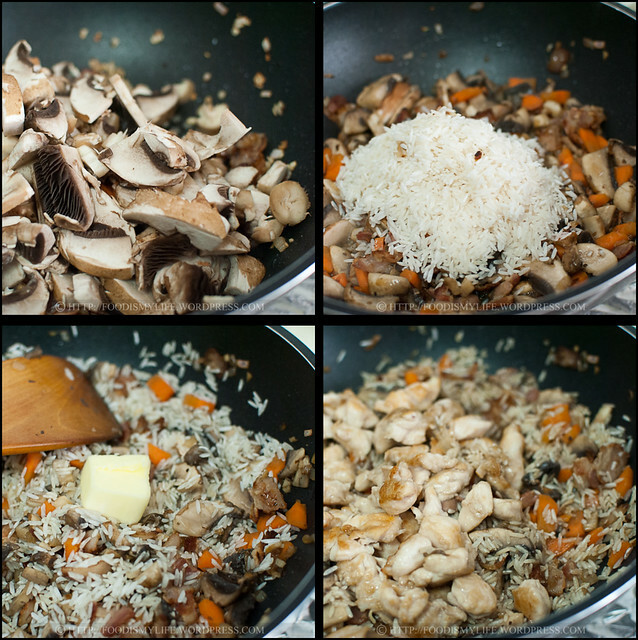 Mushrooms – my absolute favourite in the baked rice. I used a mixture of Portobello and button mushrooms. 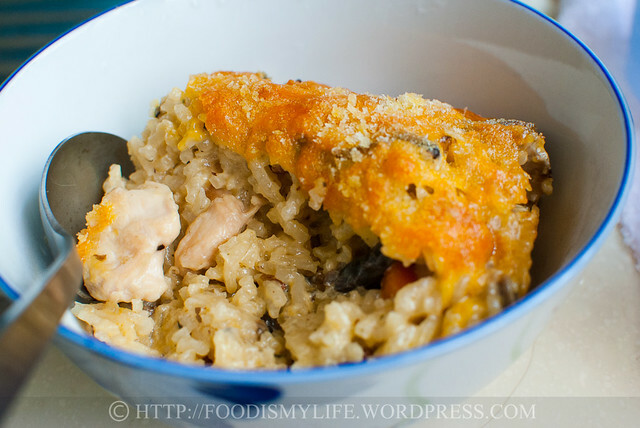 They give a nice chewy texture in the baked rice and gives off an absolutely wonderful flavour in the baked rice. Don’t leave them out! Bacon – for some smokiness and good-old bacon fat 😉 Feel free to omit and just use olive oil! 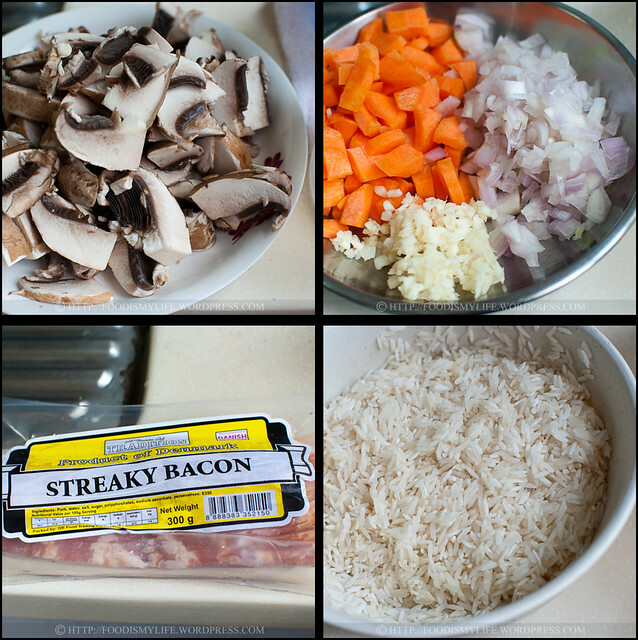 Rice – one thing I love about this recipe is I don’t have to cook the rice first. This means one less pot to wash and no worries about the amount of cooked rice needed! 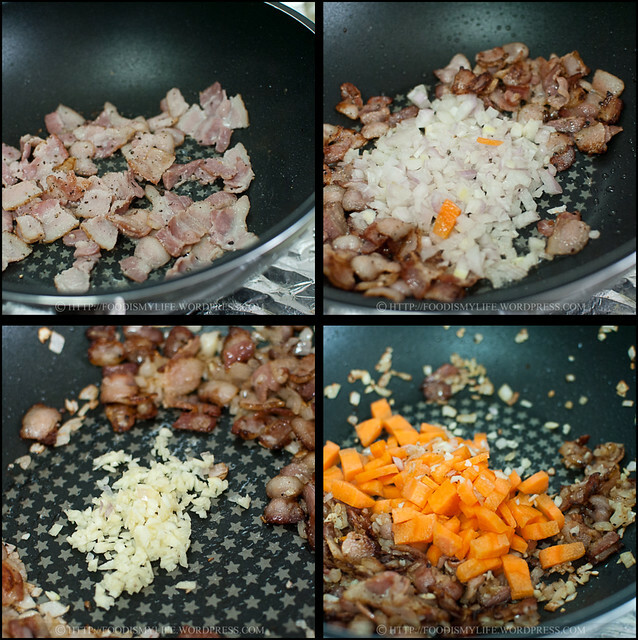 Fry some bacon to get it crispy and to render the fat, then onion, garlic and carrot goes in with the bacon. Your house will start to smell yummy already. More ingredients are going in! Mushrooms are then added in and cooked till they have reduced. The rice and butter goes in next. The butter gives a little richness into the dish. The chicken then goes in as well. The liquids and cheese go in next! Cover and bake, top with more cheese and bake again! I’m going to submit this recipe to Bizzy’s Recipe Box #22! 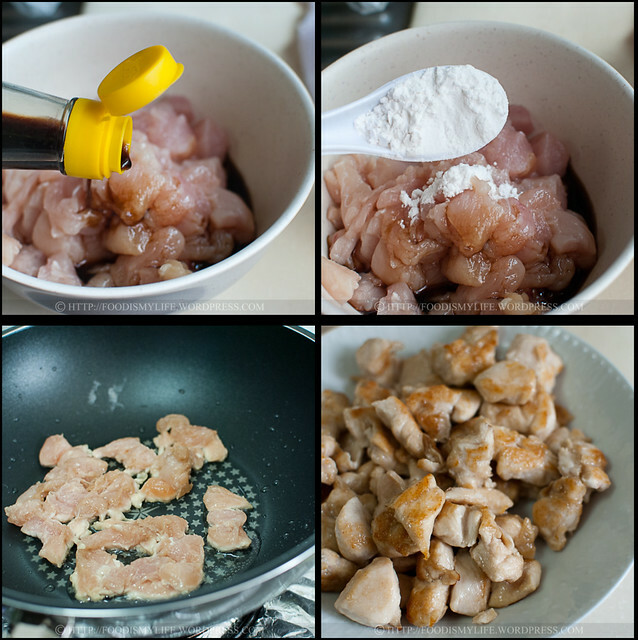 Combine the chicken, light soy sauce and corn flour in a medium bowl. Cover and marinade for 15 minutes. Preheat the oven to 175 degrees Celsius. Butter a 10x10x3-inch baking dish and set aside. Heat a large wok over high heat and drizzle in some olive oil. Add in the chicken in one single layer and sear them till one side is golden brown (try not to touch them while they're searing so you get a nice golden brown colour). Flip the chicken to the other side and sear till golden brown. Remove the chicken with a slotted spoon onto a plate. Set aside. In the same wok, add in the bacon. Lower the heat till medium and fry until the bacon is slightly crispy and fat has been rendered from the bacon. Make a well in the center and add in the onion - fry until the onion is translucent. Make a well again and add in the garlic and carrot - fry until fragrant. 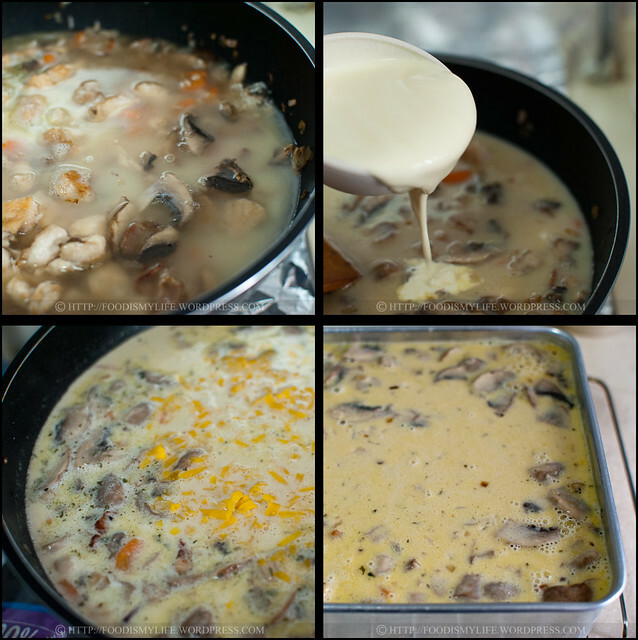 Add in the mushrooms and fry until the mushrooms have reduced and softened. During this process, add in more oil when deemed necessary. Add the rice into the pot and stir to mix them altogether. Add in the butter and stir. Once the butter has melted, add in the chicken pieces, chicken stock, milk, cream, salt and black pepper. Bring it to a simmer, stirring occasionally. Turn off the heat and stir in 125 grams of cheddar cheese (1¼ cups). Transfer the mixture into the prepared baking dish and spread it out evenly. Cover with aluminium foil and bake for 30 to 45 minutes, until most of the liquid has been absorbed. Remove the aluminium foil and sprinkle the remaining 75 grams of cheddar cheese (3/4 cup), Parmesan cheese and bread crumbs evenly on top. Bake for another 15 minutes until the top is bubbly and golden brown. Serve the baked rice piping hot! Super Naggy: It seems like a long list of ingredients but every one of them is worth the effort and flavour. I love how versatile this recipe is – instead of using chicken, use roasted shredded chicken/turkey. Add in other vegetables like peas and broccoli. Swap out the bacon and use olive oil… Or just bake it plain (refer to original recipe) and serve it with some yummy steaks and mushroom sauce. Play with the recipe, use your favourite ingredients and let me know what’s the killer concoction for you! Hi, tried this recipe out, was fab but used a deep casserole which forced me to have to bake it for much longer as the cream did not reduce fast enough. Sprinkled curry powder as seasoning before tucking in! Awesome! oh hohohohoho this is absolutely delicious! Your solution to “cream-of-whatever” soup is fantastic. (I’m not a fan of them either.) This looks just right! I also appreciated your tip on corn flour and your list of usual culprits. 🙂 Great recipe — thanks! Pinning this! 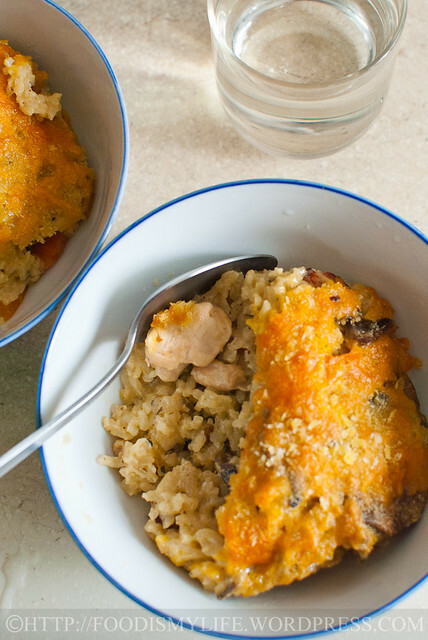 I love any combination of rice and cheese – this looks fabulous! That cheesy crust looks delicious! My goodness this does look like a hearty and satisfying meal for at LEAST 8 people. A little of this would go a long way. I think it would be a great dish for a family or workplace gathering as it would stay warm and would appeal to a lot of people.